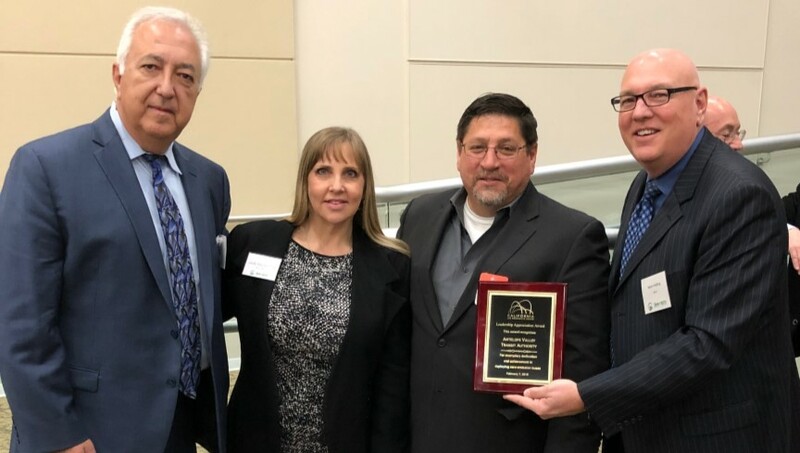 LANCASTER – The Antelope Valley Transit Authority was awarded the Leadership Appreciation Award by the California Air Resources Board for “exemplary dedication and achievement in deploying zero-emission buses” during the Zero Emission Bus (ZEB) Tech Showcase and Symposium. The Symposium was held Thursday, Feb. 7, in Sacramento. It featured more than 40 speakers, including the heads of the California Air Resources Board and the California Transit Association, as well as leaders from the City of Shenzhen in China, which has been a global leader in the electrification of buses. AVTA’s Executive Director, Macy Neshati, accepted the award on behalf of AVTA. “As we near the completion of our goal to be the first 100 percent emission-free transit agency in the nation, I am extremely proud to say that it is the Antelope Valley community that is leading the entire nation in this worthwhile goal,” added AVTA Chairman Marvin Crist. The Symposium was sponsored by AVTA, the California Transit Association, and the California Air Resources Board. 3 comments for "AVTA receives leadership award"
Marvin Crist wouldn’t be bullying anyone if the people would stop voting for him. Marvin “what’s in it for me” Christ is chairman for life on every board he is assigned to. The cowards are those fellow board members he serves with being too afraid to challenge the bully who controls them.